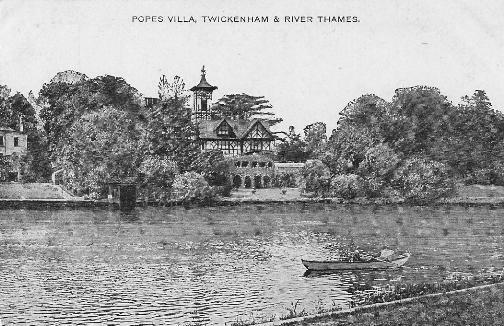 'The house at Twickenham, celebrated by the residence of Mr. Pope, who removed into it with his father and mother about the year 1715, was, after his decease, purchased by Sir William Stanhope, K.B., brother to the Earl of Chesterfield, who made great alterations, added to it two wings with offices, and greatly enlarged the gardens behind the house, which communicate with each other by a subterraneous passage or additional grotto. 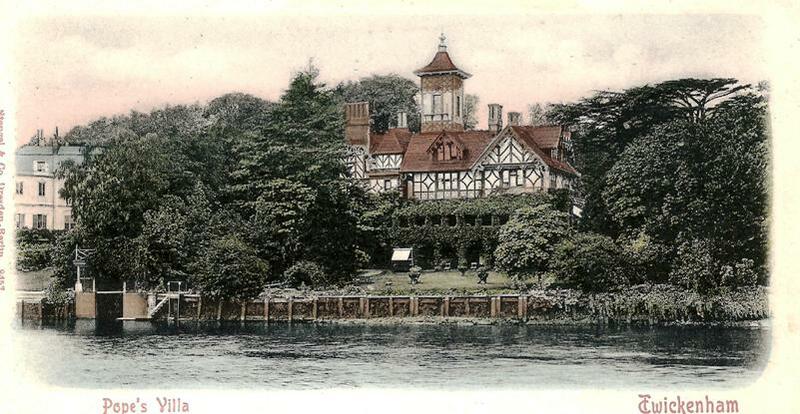 On Sir William's death, this villa became the property of the Right Hon. Welbore Ellis, who married his daughter, and was, August 13, 1794, created Lord Mendip, and died February 2, 1802, leaving it to his heir and successor, Henry Welbore Agar Viscount Clifden* (now Lord Mendip), who directed it to be sold by auction by Mr. Christie, May 17. Another correspondent to the magazine stated that this was incorrect, and that possession of the villa (and subsequent decision to sell) passed to the Earl of Chesterfield, not Lord Mendip. 'During the recent sale of the collection at Strawberry Hill, I visited the garden of Pope on the bank of the Thames, and passed under his grotto to the northern portion of his grounds, which was by this rustic tunnel, running under the highroad, connected with the verdant lawns that skirt the river's brink in front of the site of his dwelling. It is well known, of course, to most of your readers that Pope's villa was some years since pulled down. A new building is about to be erected on its site; the grotto is still so essentially necessary as a passage to the larger or back garden that it will remain, I believe, undisturbed. 'This artificial cavern has been despoiled of the glittering spars and mirrors with which Pope had decorated it by order, as reported, of a noble lady, formerly occupying the poet's residence. She feared, it is said, that the grotto would, by these decorations, still continue to attract the eyes of curious intruders.... The poet's own account of the glittering crystals of his grotto in a letter to Edward Blount, Esq., dated June 22, 1725, may be interesting, as also to know that it still retains some marked features by which it may be identified with his description (...). 'The spring for which Pope desired a guardian nymph in sculpture had for years disappeared; it had again been recently discovered, and is made to flow into a stone cistern, in which gold and silver fish are gliding. 'Over the northern entrance to the grotto I observed a stone about six inches square let into rustic work, which bears this inscription: "Secretum iter et falientis serviter vitae," placed there, no doubt, by the poet. 'Two lofty cedars raise their proud tops in the northern garden, doubtless remains of his "wilderness."